I am so so so sorry this is so late! Parker had shots today and my whole day was just crazy! He did pretty well though. Without further ado, the winner of the guitar pendant from Artistic Flair is Cathy! YAY Cathy! You can see Cathy's card HERE. And the winner of Love in the Air from Unity Stamp Co is Kimberly! You can see Kimberly's cards HERE. 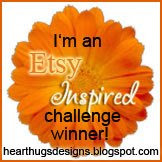 Big thanks to Artistic Flair and Unity Stamp Co for sponsoring another great week of EtsyInspired! OMGOSH! I won that awesome guitar pin. Do you see me jumping up and down and screaming? How exciting! Congrats Kimberly on winning that sweet Unity kit. Yay! I'm excited to win...thanks!